Founder of a violin-making dynasty, G. B. Ceruti did not begin his career in the field until the age of forty. He was born in Sesto in 1756, just outside of Cremona, and moved to the city with his family in 1786. He was initially employed as a weaver. While it was thought that he learned his trade from Lorenzo Storioni, in the writings of the great collector Count Cozio di Salabue, it was discovered that Ceruti actually studied with Count Alessandro Maggi, a collector and amateur maker. Ceruti’s late entry into the field did not hamper his success. Both Ceruti and Storioni are recognized for revitalizing the Cremonese tradition of making and the Ceruti family dominated violin making in Cremona for the next three generations. Giovanni Battista continually refined his work throughout his career, and he took full advantage when Storioni left Cremona in 1802: the next decade was his most productive period. 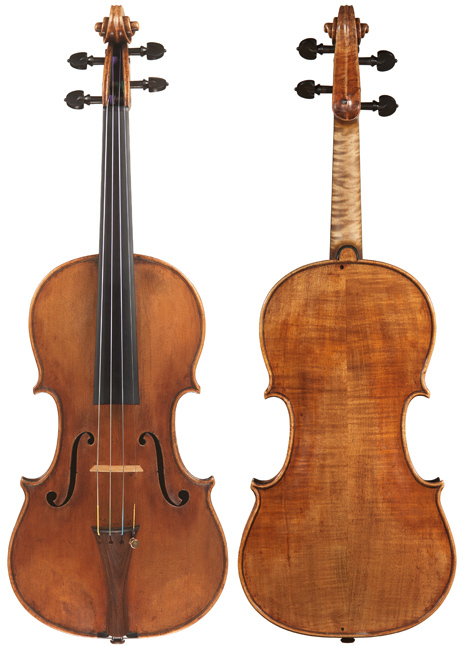 Instruments by Ceruti are still in demand today and admired for their craftsmanship and precision, producing an evenness across all registers that is rich and robust in tonal complexity with strong projection: all qualities this Ceruti violin has in abundance.